There are known technological limits to the realisation of a High Resolution Spectrograph for the E-ELT. E-ELT has a very large numerical aperture which determines the size of the pupil in the spectrograph. Such a pupil cannot be handled by a single diffraction grating which would have to be manufactured in a size largely exceeding Industry capabilities. Not to mention that the instrument built around such hypothetical grating would be so large to exceed any reasonable mass and volume limits. The HIRES Instrument concept is based on the studies for CODEX (Ultra-stable High Resolution Spectrograph in the Visible - Pasquini et al 2010, Msngr. 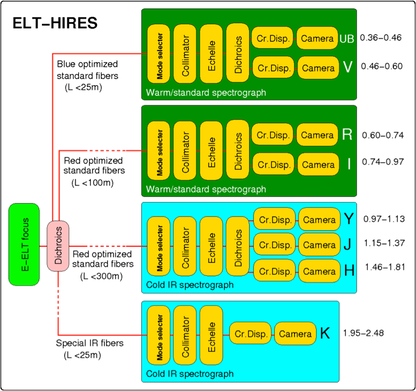 140, 20, 21 ) and SIMPLE (High Resolution IR spectrograph - Origlia, Oliva, Maiolino et al. 2010, SPIE 77352B) carried out in the phase of definition of the E-ELT Construction Proposal. The Spectrograph will make use of slicing (pupil slicing like CODEX and/or Image slicing like SIMPLE). 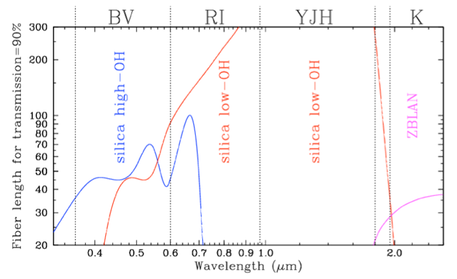 In addition HIRES is conceived as a wide spectral coverage instrument (from B-band to K-band). This will require to design more than one spectrograph, in a modular approach, each optimized for a fraction of the spectral coverage. A scheme of the modular concept is given in the following figure. The modular concept implies a volume occupation at the limits of the volume available on the Nasmyth platform as currently designed. It could be beneficial to off-load some of the modules out of the platform with a fiber feeding system. Due to the large size of the telescope the fiber feeding will be necessary long and, due to the intrinsic tranmission of the fibers (see following figure) can only be thought for the near-IR arm. The HIRES initiative is in the process of writing a "blue book" describing technical solutions that will be linked HERE as soon as available.